I'm a Principal Engineer and Certified LabVIEW Architect working in LabVIEW R&D at NI. 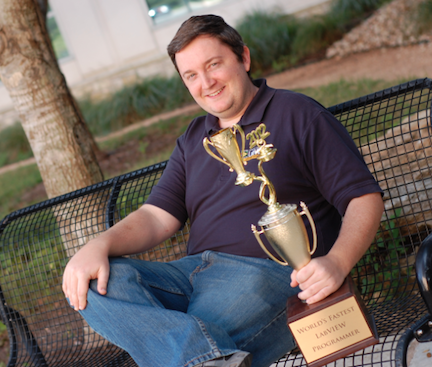 I am the (now-retired) 7-time undefeated champion of the World's Fastest LabVIEW Programmer challenge at NIWeek. My secret to success in the coding challenge isn't really a secret...I implemented Quick Drop in LabVIEW, and am one of its fierciest advocates. Being able to drop objects by name, as opposed to palette location, is the most effective way to improve your LabVIEW programming speed. Good luck to the challenge competitors in 2015 and beyond!" I am also a confirmed dev in labview since 1997, well it's a real pleasure to work with this Product . You have maded a great Work .